Poverty and environmental deterioration plague nearly all mega cities today. It’s just a fact. In crowded, often flooded alleys, washing laundry, pedicures and manicures, cooking and street fighting all take place on the same stage. For many of the unemployed, bingo and drinking start in the morning, while barely clothed kids run everywhere and girls as young as 6 or 7 are left to care for younger siblings. It’s numbing – the flat, heavy downside of our bursting cities. 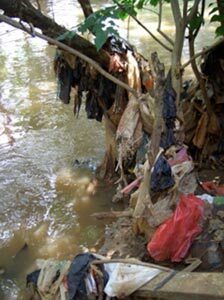 Its people have become INVISIBLE as well as its mountains of trash. In Manila’s overcrowded neighborhoods, unskilled urban poor usually have no income possibilities beyond serving others as in washing laundry and driving pedicabs. They have no skills, they have no tools. There are thousands of families of squatters who live just over the wall from Manila’s most elite neighborhoods. IT’S UGLY, but it’s real. Hanging out with them, I’ve learned that these girls have beauty, humor, dignity and talent. What they lack is opportunity. AND SO MUCH TRASH… who planned for all of this? Clearly, no one. Most visible trash is disposal waste, like the billions of plastic bags that now clutter and clog land and seascapes everywhere. We don’t know what to do with them or how to get rid of them so we try not to notice them. Then there is the other waste, unseen factory waste. This seemingly useless material waste is outside of our vision, we don’t see it at all. Manufacturing and factory waste is largely unmeasured, unreported and unseen. Factory overruns are dumped quietly into landfills on moonless nights, adding to the billions of tons of unworthy, unusable “trash”. Everywhere, no one knows what to do with e-waste: all the gizmos and guts from computers, printers, phones and iPods, all of the obsolete techie toys. Take a deeper look… Developing countries have weak environmental protection enforcement. Economically, the need for investment and industry outweighs environmental care. Typically, first comes the damage, then the clean-up. With poor nations competing for global manufacturing giants to bring jobs to their populations, political will for environmental protection is weak. 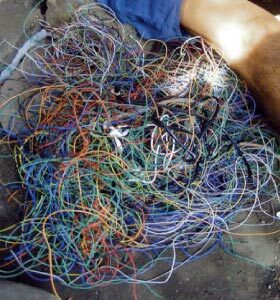 Technology develops much faster than international legislation on harmful waste disposal, leading to illegal dumping of e-waste and other toxic materials. 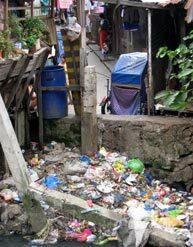 ”Treaters” is the legal term for groups in the Philippines who claim to treat harmful waste for safe disposal, but actually, proper dismantling of machines and safe “treatment” methods are still a dream. Treaters can be bought, conveniently paid to rid the manufacturers of the waste, erasing the problems. INVISIBLE and XSProject are very simple concepts to raise awareness of the issues while creating income for those who need it most. We aim to keep harmful materials out of landfills or being burned by directly reusing them to make new products. We are at the beginning of a total design overhaul. The Industrial Revolution brought us speed, convenience and pollution. The manufacturing priorities and processes at work for 200 years permitted vast amounts waste and planned obsolescence ensured on-time expiration, predictable sales and a constant new menu of everything “new and improved!” This cradle to grave design concept is on its way out as we reevaluate our dangerous dependency on non-renewable resources and understand how profit-making has been given a higher priority over environmental care. Landfills are graveyards for our waste. WE WILL BE EXPERIENCING A COMPLETE SHIFT IN HOW WE DESIGN AND USE EVERYTHING IN THE MATERIAL WORLD. That is very exciting!!! But it is not here yet. 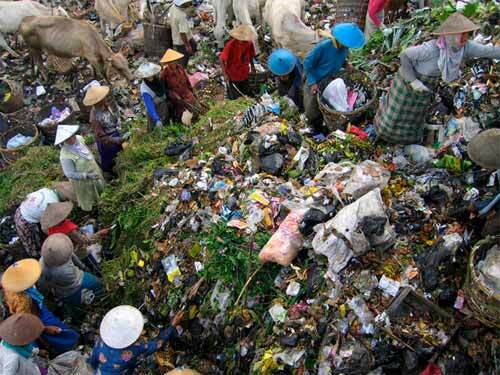 We still need to deal with the billions of tons of garbage as it pours out of our markets and factories.